Mix together soy sauce, brown sugar, wine, sesame oil, ginger and garlic. Pour half of the marinade over the chicken and let sit in refrigerator overnight. Set other half aside to *marinate the pineapple the next morning. Skewer the chicken and the pineapple separately (or together). Mix up another batch of sauce and boil on stove top thickening with cornstarch if needed. Use to baste the chicken pieces during grilling. 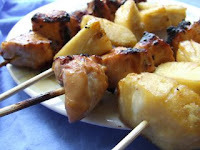 Grill or broil until chicken is done and pineapple is warm and slightly browned. *You can add more brown sugar to the marinade for the pineapple if you think it might be too bitter.